Starting with Fiesta Movement in 2009, Ford has probably used social media as a launch platform more than just about any automaker. The Dearborn, Mich.-based company is definitely the first to introduce a vehicle entirely through social channels (the Explorer crossover in 2010). On Tuesday, the company used Social Media Week, appropriately enough, as a soapbox to introduce the latest chapter of the Fiesta Movement campaign backing the 2014 model of the compact car. The campaign, "Fiesta Movement: A Social Remix," will feature 100 "agents" with a big online following. They will be an ethnically diverse group of "vibrant voices and talented storytellers" chosen both for their digital popularity and for having personalities and lifestyles aligning with the Fiesta zeitgeist. To prove they should get the nod, people have to make a video detailing why they should get the nod. The application process makes it clear that candidates who don't blog, vlog, do lifestreaming, photography, media manipulation technology (and are not therefore digital immigrants) might as well get lunch. The agent gig: experience the car in one's daily life and talk about one's daily lives ... and the car. 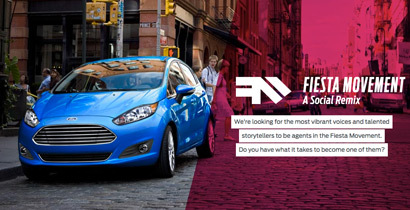 To make that life less prosaic, Ford will give each month a theme and the agents' projects aligned with those themes that also require the Fiesta. Scott Monty, Ford's global digital and multimedia communications manager, said the campaign evinces the automaker's orientation toward tactics in which earned, paid and owned media are intertwined, versus a more traditional separate-but-equal approach where the paradigm is to have a TV campaign, a digital campaign, social elements, and owned content. There will be activations against media partners like "American Idol," and possibly with the Summer X Games and the Bonnaroo music festival in Manchester, Tenn. They will feature some of the 100 agents driving the campaign, who will disseminate content through their own channels, versus just appearing in a commercial, per Crystal Worthem, Ford brand content and alliances marketing manager. She says Agents will do activities aligned with a monthly theme for the campaign. For example, agents whose dream trip is to go to a big music event will have carte blanche access to Bonnaroo, sharing their experiences through social channels, and possibly on Fuse's coverage of the concert series. "We will do something different for each partnership," she says. "For ‘American Idol,’ for example, we will have certain elements on air, but we will also try to get ("Idol" producers) to agree to having agents come on site and push out content from behind the scenes." Monty says the social executions reflect a "context, not content" approach, where the point is not to use a fire hose approach to digital channels, but to put media in the right place in a timely fashion. "If you look at the proliferation of content, it's now everywhere. So the challenge is staying relevant; and you have to embrace the platforms your audience uses." He tells Marketing Daily that Ford's media and social approach evinces the automaker's global One Ford program aimed at efficiency and a holistic approach to pretty much every part of the company. "We bring a SWAT-team approach to social strategy," he says. "We want to create space in our plans for a flexible media strategy; that's really important." 3 comments about "Ford Puts Social At Center Of Fiesta Movement Program ". Jonathan Hochman from *, February 19, 2013 at 5:43 p.m. I saw the event in person and Scott gave not only an awesome presentation, but showcased the dynamic strategy of Ford's upcoming 'One Social Vision'. Karl Greenberg from MediaPost, February 19, 2013 at 6:18 p.m.
Jonathan Hochman from *, February 19, 2013 at 6:21 p.m.
Karl, and apparently is an expert on Sherlock Holmes.